Dr. King is a former college professor and served in the Georgia State House of Representatives. She is a recipient of the Life Prize Award (2011), the Cardinal John O’Connor Pro-Life Hall of Fame Award (2011) from the Legatus organization and the Civil Rights Award from Congress of Racial Equality (CORE) (2011). She is a bestselling author; among her books are How Can the Dream Survive if we Murder the Children? and I Don’t Want Your Man, I Want My Own. She is an accomplished actress and songwriter. The Founder of King for America, Inc., Alveda is also the recipient of an honorary Doctorate of Law degree from Saint Anselm College. 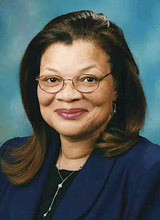 She has served on several boards, including Heartbeat International, Georgia Right to Life, MLK Center, Bible Curriculum in Public Schools, and Abortion Recovery International (ARIN). She is also a member of the National Black Prolife Coalition (NBPC). Dr. King lives in Atlanta, where she is the grateful mother of six and a doting grandmother. Life - Abortion is not a civil right. How can the dream survive if we murder the children? How Can the Dream Survive If We Murder the Children? : ABORTION IS NOT A CIVIL RIGHT! How Can The Dream Survive If We Murder The Children?This compelling question impacts nations and generations of human beings, many of whom have experienced physical, emotional and spiritual oppression spanning the course of many lifetimes. How Can The Dream Survive brings hope, light and life to those who have pondered the issue of abortion, and whose questions have yet to be answered: Is abortion a civil right?Is abortion good for women?What's so bad about genocide?What would Dr. Martin Luther King, Jr. say about abortion?Who are the survivors?What about life, liberty and justice for all? As the niece of Dr. Martin Luther King, Jr.; daughter of Rev. A. D. King, and granddaughter of Dr. Martin Luther King, Sr., Alveda shares her personal testimony with compassion and sensitivity. Love is a powerful force, and her message of life, love and justice resonates. Alveda is a mother, grandmother and minister of the Gospel of Jesus Christ. I Don't Want Your Man, I Want My Own takes an in-depth at questions facing African-American women for generations.